Starlight Carnival is the third stage of Sonic Colours. The stage takes place at Eggman's new space fleet, which also serves as one of the attractions of Dr. Eggman's Amazing Interstellar Amusement Park. It is full of brightly-colored neon roads, signs, and statues, fireworks as well as paths that materialize as Sonic runs along them. Numerous throwbacks are in this zone, from the Aero-Chasers and in Sonic Unleashed to a huge Motobug speeding on the path. Both the Blue and Green Wisps make appearances here. After some exploring, Sonic and Tails run into Eggman, who attempts to brainwash them using his new mind control beam. Tails saves Sonic from being zapped, but as a result, he suffers the effects of the beam. Eggman proceeds to commanding Tails to attack Sonic, but just before he deals the first blow, the effect wears off and Eggman goes to search for more Wisp energy to power the beam. After defeating the boss, Sonic asks Tails if he was able to extract any more information from Yacker. Tails then explains to him that Eggman is using five tractor beam generators to hold each planet in orbit while he captures all of the Wisps. Upon receiving this information, Sonic sets off to shut down the last three generators before time runs out. Sonic begins upside-down inside the ship of the large, brightly-colored and brightly-shinning, fleet ships and races out onto what is suppose to be an invisible platform that appears in front of him and disappear behind him. He races around one ship and follows a pair of Aero-Chasers, who die. Floating in the airless space, he bounces off some pieces of what look like prism stones. Sonic races long the same path and hops into one of the ships, passing through the very first checkpoint. Inside the ship introduces the Blue/Cube Wisp. After a few practice with it, Sonic finds his way outside the ship and races away from the flying carnival, followed by the Motobugs. When they are gone, the flying carnival from behind Sonic teleport in front of his eyes. Within' sight, he, or you, should spot the largest ship. The path curves and Sonic hops inside. Using the blue wisp over and avoiding the ship's main trap, he races outside again and jumps of the end of the path. Bouncing off the same stones from the beginning, Sonic flies into another ship, which holds the goal ring, he was looking for. Starlight Carnival Act 2 takes place entirely in 2D and makes use of several different blocks. The first room inside of the first ship from Act 1 has been rearranged and Sonic must use the Blue Cube and Pink Spike Color Powers to collect all of the Red Star Rings scattered around the room and find his way to the goal ring. Starlight Carnival Act 3 takes place entirely in 2D and introduces Yellow Springs that Sonic can stomp on to reach higher altitudes. Almost the entire stage is made of platform and solid blocks. This area of the stage isn't accessible in the previous acts and is based on the deck outside of one of the starships. During the first two sections, the springs will move slowly to the right with Red Rings hidden above. During the third and final section, the springs will begin to move upward, to the left, and upward again, with Red Rings placed within the small floating rooms and below an electrocuting Spinner. Starlight Carnival Act 4 is another 2D act that takes place inside one of the battleships. Floating orbs shoot out green energy shots that Sonic must dodge while navigating through the platform blocks to reach the higher room. In it, Wisp blocks that can only be broken with the Purple Wisp (found later in the game) obstruct Sonic's path on his way to the goal ring. After a short 3D Aero-Chaser/Quick Step section, Sonic revisits the area from Act 3, which is now filled with Egg Pawns. Hidden above is a small solid block maze in which the Pink Wisp must be used to race to a Red Ring that can be found there. 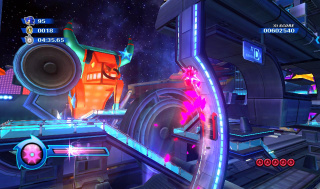 A ramp leads Sonic to a tower that he can scale using the Homing Attack and Green Hover Color Power. On the top is a wire that leads him to another set of solid and wisp blocks that can be broken using the Pink Wisp. At the end of the stage is another tower similar to the first, but smaller and using the 3D perspective. On top of this tower is the goal ring. Starlight Carnival Act 6 takes place in 2D and is made up of breakable, solid, and platform blocks. Using the Green Wisp, Sonic must travel upward to reach the goal ring while collecting the Red Rings (one of which can be found beneath the starting point) along the way. This page was last edited on 7 March 2018, at 16:27.